← Is it possible to have status in academe without tenure? Two thousand sociologists in one place? Sounds like a crazy time. This will be the eighth year that I’ll attend an academic conference. I try to go to two meetings a year (one local and one national), depending on where they’re taking place and if I can find funding to subsidize travel costs. I find these meetings to be really helpful to my professional life. Ever since I’ve been active on Twitter, I also find it’s great to connect with other folks via social media and that contributes further to my knowledge base and social network. Plus, I’m a social person so conferences really work for me. I am comfortable talking to people about my research or <gasp> my personal life. Last week, I read a few posts on attending conferences (one on scatterplot and another here) and thought I’d chronicle some realistic and supportive thoughts, too. Take yourself seriously. 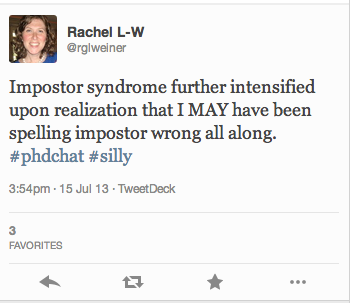 Impostor syndrome is a thing and you may feel it at the annual meeting. As someone with little status, it is easy to feel like an impostor or an outsider at the annual meeting. It looks like everyone knows everyone else. It feels like everyone is staring at your name tag trying to feel superior, jockeying for exposure, and generally posturing. It is possible that folks from your own department or graduate program may not (or choose not) notice you. Who cares? No one is going to stop you and demand an explanation for why you’re there. Know that you have something to contribute and feel good about it. Be prepared to discuss what you study. That doesn’t mean rehearse it, but be prepared to answer the stock questions about your dissertation or your research. Think about your elevator speech so you’re not caught off guard when you have to deliver it. Learn something new. There is general malaise about the quality of paper panels, but papers aren’t the only thing happening at the conference. There are workshops on teaching and research strategies, book discussions, movie screenings, and panels on professionalization issues. Attending non-paper sessions puts you in touch with people you might not have otherwise met. Hell, last year, someone just sat my coffee break table and struck up a conversation about the meeting. It was pretty old school in terms of social networking, but I learned about his institution and some of his teaching challenges. Most people are disillusioned after attending too many annual meetings, but there is a chance to actually learn something or meet someone. So do that. Follow up. When you get home, connect with folks you met or dig up things you learned. You want to catch people when they’re fresh off the meeting. Thank them for their time (if you met with them) and send anything you promised to send. Build your social capital. Think about what you’re going to wear. You will feel good if you look professional and hip. I do, anyway. If you’re an American sociologist, remember that our annual meeting is held in August so you have several issues to contend with: climate (it’s 100 degrees outside and 50 degrees inside) and distance (conference centers tend to be huge). If you’re a lady, throw some flip flops in your work bag (they’re flat and they’re a huge relief when you have tons of blisters from fancy, professional shoes). Think about layering so you can be warm in the frigid conference rooms and breezy when you’re tooling around the city outside of the conference hotels. Give some thought to both day and night ensembles, too. There are receptions and get togethers and you want to feel (and look) good at your presentation and your section dinner. Plan your day ahead so you can walk with intention. File this advice under “fake it til you make it” but there is nothing worse than fumbling with your program or your schedule and looking altogether out of control when a “famous” sociologist walks by. Your presentation of self matters, right? Plan ahead so you can feel confident as you navigate the conference. Pack snacks/drink coffee. You will get hungry. You will feel tired. Food and caffeine will help. What did I forget? Remind me in the comments! Hope to see you in real life or on Twitter at the American Sociological Association annual meeting in New York this week! I’ll be live-tweeting sessions on education, teaching, and poverty and doing my fair share of social networking as well. This entry was posted in academia, blogging, coffee, community, fashion, grad school, higher education, lessons learned, sociology, travel, work and tagged sociology. Bookmark the permalink.